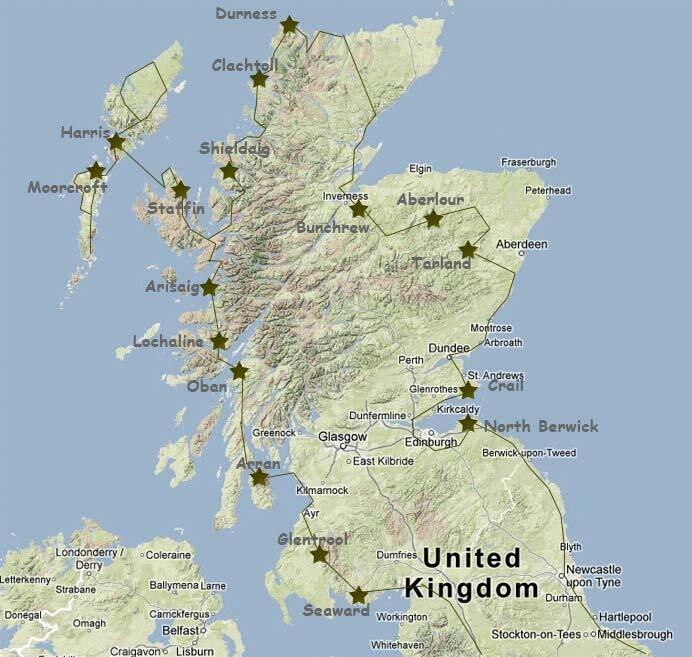 Below is the map, itinerary and general information and tips from our Scotland in a Motorhome Tour in the Spring of 2012. I have written down all the stages of the entire Route, from Gretna Green to North Berwick, the stage distances and the points of interest we have been to. There are of course much more things to see and do, the choice is all yours. 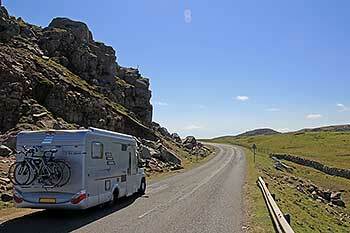 I’ve also included links of the campsites and a wee impression. We were travelling with our three year old daughter so we took things easy and stayed sometimes two or even three nights on one campsite. Our original plans included the Orkney Islands and without these double nights on one campsite we probably could have made it but what’s the point of having a holiday when you need to rush? Feel free to use or modify this itinerary for your own needs, I hope it can help you to plan your Motorhome Holiday together with the other information provided. If you have any questions please feel free to contact me. Please note that all the campsites listed below have facilities for taking in fresh drinking water, grey water disposal and a chemical toilet disposal point except the field in Shieldaig and the Horgabost site in South Harris who don’t have facilities for Chemical Toilets. The Chemical Toilet Disposal Point in South Harris is located at the Calmac Ferry Terminal in Leverburgh. Prices for the campsites below for one night vary from £16 to £22 including electrical hook-up. The Camping and Caravanning Club Site in Tarland charged £27 for one night, this was by the way the only site of the Camping and Caravanning Club during our tour. We could have avoided this one, there was another site nearby, or we could have become a member, fee of £40, or a temporary membership for overseas visitors for £20, and receive a discount. We choose not to, it was the final week of our holiday and besides, there are only 10 or so Club sites in Scotland from which four are close to Inverness. Usually when you arrive you report to reception and ask for an available pitch. It happens often that reception is closed and you have to find a pitch for yourself and report at reception later on. Be careful when you look for a free pitch because it might be taken already. Usually the owners leave their electric cable or a chair to let others now the pitch has been taken. I’ve also seen people who had a number plate on a wee stick to let others know the pitch had been taken. If you respect these signs and choose your pitch carefully you won’t get into trouble. Booking in advance or not? Depending on the season you might want to book in advance. A good tip is to use an app or POI file on your navigation system, smartphone or iPad if you have one. I had a very good experience with Archies Campings who offers listings of campsites with their phone numbers and travel directions. Great when you’re on the move. We booked a site a couple of times, just to be sure we had a pitch or because we wanted to stay a few days longer. The fun however of touring in a motorhome is not knowing when you end up and you don’t want to search for too long to find a campsite. So booking in advance can be a good idea, especially when the season progresses and campsites become busier. If campsites are occupied or if you rather save your money you can always go Wild Camping. It’s a right you have in Scotland but there is more and more opposition against it. Quite a few parking places have signs that say “Overnight Parking is not Allowed” or other measures have been taken to make it impossible to park. But don’t forget, Scotland is remote and the further north and west you go in Scotland the easier it is to find a good place to park your motorhome. If you want to know more about Wild Camping for Motorhomes in Scotland and the places where you can park for free you might be interested in the site www.wildcamping.co.uk. Campsite impression: Excellent, clean, modern facilities with WiFi. Campsite impression: Lovely wee site, pitches next to the beach, quite busy in season, no children playground, stunning views and sunsets, unsheltered in bad weather, clean. Campsite impression: Unmanned site, pay 10 pounds in an envelope on exit, excellent showers, no electrical hook-up, metres away from the beach and Dunes, perfect site. Campsite impression: Good facilities, clean, busy, nice beach, free WiFi, lot of pitches, great views. Campsite impression: Perfect, clean, quiet, outstanding campsite. Campsite impression: Clean, quiet, excellent facilities but member of “The Club” which means expensive if you’re not a member. Campsite impression: Ideally situated near the sea, great views, relaxing site, good facilities. Campsite impression: Ideally situated close to the sea above golf links, great views, large site with almost hundred pitches, good facilities, path to the beach.